A former resident of Ohio, John A. Rodehaver, named the Decatur county seat town after the Ohio town of Oberlin. Nestled in the Sappa Valley at the intersection of U.S. 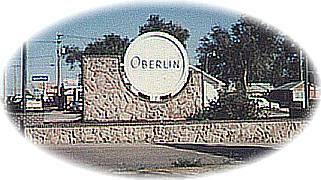 Highways 36 and 83, Oberlin offers an exciting blend of history, recreation, family-oriented activities and scenic beauty. A community which wants to share its past, present and future with you. Pete Felten\'s \"Pioneer Family\" native limestone statue overlooks the central business district. Connecting canopies, pleasing architecture, global lights, and appealing store fronts create a unique shopping experience. Recreation abounds in our area. Nearby lakes and streams offer excellent fishing and boating opportunities. Our rural location, complete with fields and creek bottoms, provides some of the best pheasant hunting in the Midwest. You can also enjoy a day of challenging golf at Oberlin\'s public, 9 hole course. Decatur County has 7,601 acres of walk-in hunting. The native limestone statue is the work of artist Pete Felten and overlooks the central business district. The Bank of Oberlin is listed on the National Register of Historic Places. This 1886 Victorian building now houses the Landmark Inn and Teller Room restaurant restored to its early banking splendor of cherry woodwork, wallpaper, and gas lights. Take a drive through the 488-acre wooded scenic Sappa Park as nature reveals its unique setting with the lush greens of spring, harvest golds in the summer, and a variety of sparkling fall colors.